Don't let your workout fizzle to a stop. Keep burning to the very end with these unique finishers that require minimal equipment. You've been working hard for an hour or more. You've done some heavy lifting, gotten in some quality volume, and you know it's about time to wrap this thing up. So how are you going to do it? By chasing that pump. 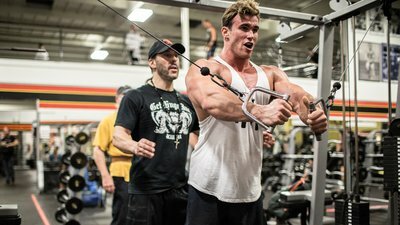 Training for the pump is all about performing high reps, which drives fluid and nutrients into the muscle and increases the muscle-building mechanism known as metabolic stress. High-rep training also temporarily inflates the target muscle, causing it to swell, which has been linked to muscle growth. As Arnold famously said, it's one of the best feelings you can have in the gym—if you can stand it! Here are new ways to get it for six muscle groups. This single-joint triceps move is best done after a heavy chest or arm workout in which your triceps are fatigued from moves like presses and dips. Use a straight bar with a rotating sleeve or rope attached to the upper pulley, and you'll need a timer or clock. No sets here—it's all about doing as much as you can in 10 minutes. How to do it: Choose a weight you can handle for about 12 reps on the press-down. Start the stopwatch and do as many reps as you can. After a 15-second rest, do another set. Keep repeating this approach until you can no longer get 8 reps. Then, reduce the poundage by one plate or pin setting, which will kick your reps up. Once you fall below 8 reps, drop again. Keep going like this for 10 minutes. Your arms will quickly swell like you've never experienced before! This technique also works well with the rope push-down. Cellucor athlete Jen Jewell recommends performing this burnout superset at the end of your workout. "I include it after I've already done some kind of weighted shoulder press as well as exercises such as lateral raises, front raises, and rear-delt raises," she says. "I often switch up those single-joint movements so that I'm always rotating barbells, dumbbells, cables, and even kettlebells to keep the stimulus somewhat different each time." How to do it: Grab the heaviest slam ball you can find. Jewell typically choose a 16-20-pounder and gets to work! Do 15 wall-ball throws, then go directly into the shoulder-press motion to failure, aiming for 15-20 reps. Rest briefly, and do another two rounds. Cross-overs are a common choice to conclude your chest training with because they're single joint and eliminate the triceps. But why just burn out on one version of the movement when you can attack the entire chest? Attach the D-handles to the upper pulleys and really pump up your chest with this two-step variation where you alternate the point of peak contraction. How to do it: Choose a weight at which you can do about 12 reps. Perform 10 reps, bringing your hands together toward your navel, somewhat mimicking a most-muscular pose, to direct the stress toward your lower-chest fibers. If you can handle it, holding your hands together for a count increases the tension on the inner area of the chest a bit more. Without resting, take two big steps forward. Now complete as many reps as you can—aim for at least 10—while bringing your hands together higher up on your torso, about chest level. This brings the focus up to about mid-pec. Rest just 60 seconds and no more, and repeat two more times. If you have to lower the weight to reach your rep target, do it. "I don't know if that's what this move is really called, but I know it's a great finisher for the lats!" says Jewell. "Do it like a standing straight-arm pull-down, only you're bent over, using one arm at a time, and holding the body of the kettlebell rather than the handle. In the video, I'm performing the move as part of a dropset, and by the end, I'm totally exhausted. You'll need two kettlebells, one about 25 percent lighter than the other." How to do it: Grasp a solid object for support with your free hand, bend over, and keep your back flat. Grip the ball of the heavier kettlebell with your arm straight and reaching slightly out in front of you. Keeping your arm straight, pull the weight back toward your hip in a controlled motion until your arm is aligned with your torso. Remember, this is not a kick-back, so keep your arm straight. Return to the start position and repeat for reps, aiming for about 12 until failure. When you hit failure, grab the lighter kettlebell and perform as many reps as possible. Switch to the opposite side and repeat. Do three dropsets for each side. You can also do a similar move standing with a single-grip handle at the pull-down station. Rather than only doing full-range-of-motion reps, you'll follow up a full rep with a partial rep over the top half of the move. Both moves equal one rep. This creates twice the number of peak contractions, which will give you a massive biceps pump. This works great on a preacher curl machine, but you can also do it with free weights. How to do it: Use a weight you can handle for 12-15 reps. Sit squarely on the machine with your arms parallel to each other. Don't allow your elbows to flare out or allow your triceps to lift off of the bench. Perform a rep from full extension to full contraction, but go only halfway back down on the negative, and contract your biceps again. Strive to reach 10 reps, but go to muscle failure, adjusting the weight as needed on the next set accordingly. Limit your rest to 60 seconds so you'll be starting again with the biceps somewhat fatigued. Get a spotter if necessary. You really want the reps to chase that pump, so lower the weight if you have to in order to manage 3 sets of 10 reps. This fireball of a finisher starts with a single-leg dumbbell Romanian deadlift, followed by two moves on the floor with your feet on the stability ball: a hamstring curl paired with a glute bridge. "For burnout moves for the lower body, I love to pair a weighted exercise with a bodyweight movement as part of a superset or triset," Jewell says. "The ball exercises are not nearly as challenging on their own, but once you combine these three together at the end of a workout, your hamstrings are putting in some serious work." You can perform a two-legged version of the RDL with dumbbells or a barbell, but Jewell prefers the single-leg version for how it feels. "The single-leg version really allows me to focus and build a stronger mind-muscle connection with the hamstrings as opposed to a traditional RDL using both legs and a barbell," she says. "I'm focused on my stability and really making sure I feel my hamstrings being recruited on every single rep."
How to do it: On the RDL, select a weight that allows you to complete no more than 10 reps per set. Remember to do both sides without resting between. Then, move to the stability ball and go directly into a combo of leg curls for 10-15 reps and glute bridges for another 10-15 reps. Perform 3-4 sets of this combo at the end of a leg workout.